X-COM: Terror from the Deep is a strategy video game developed and published by MicroProse for the PC in 1995 and for the PlayStation in 1996. It is a sequel to X-COM: UFO Defense (UFO: Enemy Unknown) and the second game of the X-COM series, this time taking the war against a renewed alien invasion into the Earth's oceans. X-COM: Terror from the Deep takes place mostly underwater, with base-building and combat all being submerged beneath the waves. This is also used as a plot device; all of the alien technology from the first game is unusable in salt water, forcing the player to capture and develop new technology. Just like UFO: Enemy Unknown (X-COM: UFO Defense), the game consists of two parts. The first is the real time-based GeoScape, a global view of Earth where the player views alien and X-COM craft and bases, can hire and dismiss staff, buy and sell vehicles, weaponry, ammunition and items, and build and expand bases. The second part, the BattleScape, is used for combat between squads of aliens and humans, and takes the form of a turn-based battle from an isometric view. Underwater battles use the same physics as the ground ones but certain weapons cannot be used on surface/land missions. The game features some mission types composing of multiple parts, such as alien shipping route terror attacks in which the first part is a battle of the upper floors of the ship while the second part takes places in the lower decks of the ship (all parts must be completed for these missions to be successful, and soldiers lost in previous parts do not appear in later parts). Aside from lengthy multi-part missions, map layouts are more complicated, there are several types of terror missions, and weapons carry fewer rounds in their magazines. Difficulty levels were markedly increased compared to Enemy Unknown. A part of the reason for the enhanced difficulty is that players complained of the first game being too easy, however MicroProse were unaware that this was due to a bug that resulted in it reverting to Beginner mode in the released version. A new feature added in TFTD was melee weapons, thanks to feedback from the players who suggested the idea. Terror from the Deep is set in 2040, four decades after the events of Enemy Unknown. Following the destruction of the alien Brain on Cydonia, a transmitter remained active there which awakened a group of aliens under the Earth's seas who had lain dormant for millions of years. After awakening, the aliens proceed to terrorize seagoing vessels and port cities, kidnapping humans to perform bizarre genetic experiments on them. X-COM, which had been disbanded after the first alien war, is revived by the Earth's governments to fight this new menace as the aliens' ultimate goal is to reawaken their supreme leader, a being that cannot be stopped once revived. Eventually, it is revealed the aquatic aliens, cousins of the Sectoids from Enemy Unknown, came to Earth on a massive spacecraft, known as T'Leth, that crashed into what is now the Gulf of Mexico 65 million years ago, causing the extinction of the dinosaurs. Destruction of T'Leth by the player results in victory but also accidentally results in another worldwide environmental cataclysm, destroying the ecosystem of Earth and setting the stage for the third game in the series, X-COM: Apocalypse. A decision was made to use the original engine, reskin the graphics and create a whole new story. By keeping changes to the absolute minimum a sequel could be created in just a few months. Also, by not inventing any new game features or game technology it would make the scheduling one largely led purely by asset creation – which makes it whole lot easier when it comes to estimating task durations and scheduling. 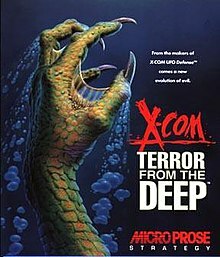 X-COM Terror from the Deep was originally released on 1 June 1995 for the PC DOS. It was ported to the PlayStation in 1996. In 1998, a Windows 95 port was released with Enemy Unknown as part of the X-COM Collector's Edition. On 4 May 2007, Terror from the Deep was released on Steam by 2K Games, who has inherited the franchise (first only for the Windows XP, but a later update which enabled Windows Vista support). The game has been also re-released as part of the compilations X-COM Collector's Edition by MicroProse in 1998, X-COM Collection by Hasbro Interactive in 1999, X-COM: Complete Pack by 2K Games in 2008 and 2K Huge Games Pack in 2009. The fan-created OpenXCom project, originally an improved, modernized remake of the first game, also added TFTD support which fixed a number of bugs and programming oversights in the original game, including better enemy AI. Together with its predecessor, UFO: Enemy Unknown, Terror from the Deep's sales had passed 1 million copies by March 1997. The game was received mostly very well by critics. PC Gamer UK called it to be "not only a great sequel to UFO but a superb game in its own right." On the other hand, GameSpot stated that "apart from new art and a handful of new combat options, this is exactly the same game as UFO Defense, only much more difficult." Next Generation felt the same: "In the end, X-COM 2 is still a phenomenal game, and has been scored as such, but it seems so much more could have been accomplished to make this game more than just a carbon copy of an old game." Julian Gollop criticised MicroProse for "some classic mistakes in turn-based games, which is to make the difficulty too tough and the levels too big, long and tedious to get through." According to Jake Solomon, the lead designer of 2012's XCOM: Enemy Unknown, MicroProse did few new things with the sequel "except made it brutally harder and made the cruise ships four times longer than any human could realistically make," yet still the game "was awesome." X-COM Terror from the Deep: The Official Strategy Guide by Dave Ellis, ISBN 0-7615-0074-X. ^ Stokes, Nick (1995). X-COM: Terror From The Deep Game Play Manual. MicroProse Software. p. 89. ^ "X-COM: Terror from the Deep – PC – IGN". Uk.pc.ign.com. 27 August 2013. Retrieved 2 September 2013. ^ a b "X-COM: Collector's Edition". MobyGames. Blue Flame Labs. Retrieved 24 February 2018. ^ "The Story of X-Com". Eurogamer. 28 November 2010. Retrieved 28 November 2010. ^ "XCOM Terror from the deep". Terry Greer. Retrieved 4 November 2017. ^ a b Dulin, Ron (1 May 1996). "TFTD review by GameSpot". GameSpot. Retrieved 30 October 2010. ^ "PC Gamer Online | X-COM: Terror from the Deep". Web.archive.org. 11 December 1999. Archived from the original on 11 December 1999. Retrieved 2 September 2013. ^ a b "Dé Jà VU". Next Generation. No. 7. Imagine Media. July 1995. p. 74. ^ Coleman, Terry (March 1997). "Winter Wonderland". Computer Gaming World (152): 209, 210. ^ "Julian Gollop on XCOM – Edge Magazine". Edge-online.com. Retrieved 2 September 2013. ^ "Know Your Enemy: Firaxis On XCOM, Part 1". Rock, Paper, Shotgun. 25 July 2012. Retrieved 2 September 2013. UFOPaedia: An extensive wiki containing information, analysis, strategy, and other resources for this and other games in the series.